Jovinus was a Gallo-Roman senator and claimed to be Roman Emperor (411–413 AD). Following the defeat of Constantine III, Jovinus was proclaimed emperor at Mainz in 411, a puppet supported by the Burgundians and the Alans. 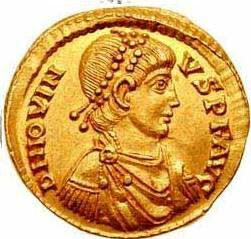 He keps his position in Gaul for two years, long enough to issue coinage that shows him wearing the imperial diadem. In 413AD he elevated his brother, Sabastianus, to co-emperor. Jovinus was soon defeated by Honorius & the Visigoths, who were offended he had not consulted them on the matter of his heir. Sabastianus died in battle and Jovinus was executed.